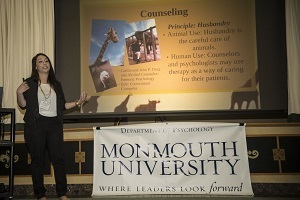 Today I visited Monmouth University to witness psychology students showcase their research and empirical findings. This is known as senior thesis. Each student picked a topic, and over the course of the semester they developed their studies and investigated their hypotheses. Some presentations included the correlation between money and depression, the technology of genetic modification, love’s influence on an individual’s thought processes, sports psychology, and Autism Spectrum Disorders.. Students also had a chance to share their internship experiences, including how their internship influenced their career plans. Thank you for taking your time to talk! Wanna start by saying your name? Of course! My name is Brenda Cunha. What do you study here at Monmouth University? I am a Psychology major with a double minor in Criminal Justice and Legal Studies. The campus itself is very beautiful and unique. The small classes make it so much easier to have one on one talks with the professors. What year did you graduate Colts Neck? Are you involved in any activities or societies? Can you explain to me a little bit about what senior thesis is? Senior thesis is a small class with thirteen students at the most. The seniors get the chance to do an independent research paper to scope, analyze, and present a specific topic. The topic can be relevant to their own field of study or another field. First the students create a thesis, then a survey, and finally they gather data from within campus. Is it a challenging course? What have been some of your favorite courses? What advice would you give to students applying to college? It is all about time. Make sure to stay on task and be ahead of all your deadlines. Cramming is not the smart thing to do because competition increases as the deadlines get closer. I would say know your schools by December. What is it like majoring in psychology? Did AP Psychology help you? It definitely helped me with my reading and writing skills. The content does get harder but AP Psychology gave me the proper foundation. Are there any other classes you would suggest taking if someone was interested in majoring in Psychology? Statistics! That class will definitely give you a head start, especially since it is something I struggle with right now. What are you doing right now? Any goals in mind? I will be graduating next year in 2019. My focus at the moment is my application to law school, which I hope to attend following graduation.